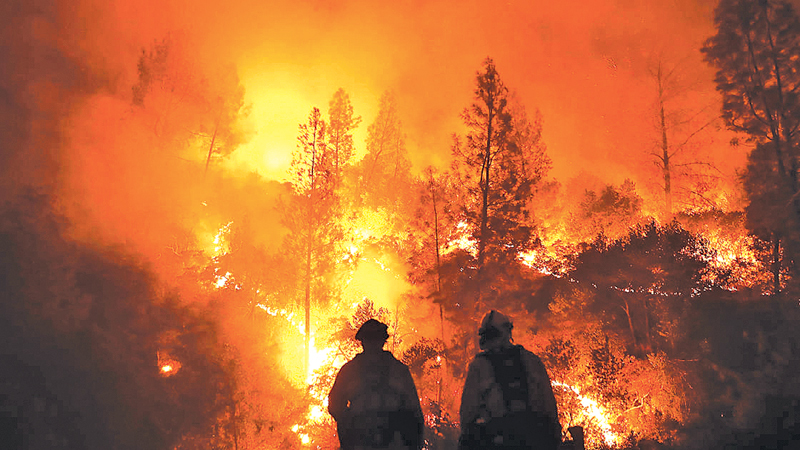 The fire referred here is raging fires across the world brought on by record temperatures and excessive heat seen and felt in many parts of the world. We are speaking at a time when the world is on fire. This summer, 119 people in Japan died in a heat wave, 29 were killed in South Korea, officials there say. Ninety-one people in Greece died in wildfires, and ongoing fires in California have taken at least eight lives. Spain and Portugal sweltered through an exceptionally hot weekend with a heat wave that has killed three people in Spain and pushed temperatures toward record levels. As the UK goes through its longest dry spell in 40 years, demand for water has risen by almost a third, according to the water industry, and Northern Ireland has imposed a hosepipe ban. Australia's Prime Minister Malcolm Turnbull has warned that the country has become a “land of drought” as he announced further measures to help stricken farmers. Although it is still winter, parts of eastern Australia are experiencing the worst drought in living memory. Ninety-nine per cent of New South Wales, which is the country's most populous state and provides around a quarter of the country's agricultural output, is currently in drought. This brings us to an ominous warning from Prof. Ranil Senanayake, an authority of climate change which is when plant cells die when the temperature becomes unbearable. The prolonged consequences would be catastrophic. Similarly, fauna, flora and the world of animals is suffering immensely. We are for example seeing livestock and animals in general gasping for breath due to unbearable heat in Europe. In Africa, they quite simply die. The passage below comes from a letter sent last year by this writer to State Minister of Finance Eran Wickramaratne suggesting MoF constitutes a committee of experts to go over the issues. In the words of Prof. Ranil Senanayake, primary Ecosystem Services are those produced by the photosynthetic activity of plants. These are the production of Oxygen, sequestration of Carbon Dioxide, cleaning water and providing ambient cooling. They help us breathe, have drinking water, food, and protect from excessive heat. Per acre per year if Sri Lanka capitalized these values we could escape from out debt trap in two years. Sri Lanka should seriously consider implementing this programme to correct the exploitation of natural resources and its owners, induce sustainable environmental practices and practice sound economics. Most importantly as Prof. Ranil Senanayake states, there is a transfer of wealth to rural areas which crucially enable life in urban areas. Measuring water print to design an ecosystem service. Thematically be it leisure, garments, agriculture etc an assessment of Water footprint can be deployed (The CDN had an interesting feature article last week on this topic). It went to say, “Water footprint referring to the amount of water used to produce different products or provide a different type of services to the human beings. For example, the amount of water used to produce a shoe or a shirt is the water footprint of that particular article. It can be estimated for a product, a service, an individual, a country and even the whole world. An individual’s consumption of fresh water based on the products and services he or she uses or consumes per year is that person’s water footprint. Measuring water footprint and taking all the necessary steps to keep that level as low as possible is extremely important for mankind. This balance is urgently required because freshwater is vital to our daily life while the supply of freshwater is limited”. We in 2005 the world was warned. We did see Cop21 being signed. The Paris Agreement within the United Nations Framework Convention on Climate Change (UNFCCC) dealing with greenhouse gas emissions mitigation, adaptation, and finance starting in the year 2020. The European continent is now being warned graphically on the consequences of insufficient action. Across the world as well as back home we need to be wise, proactive and not wait for Government only to take leadership on matters vital for the survival of life on Earth. The Millennium Ecosystem Assessment is a major assessment of the human impact on the environment, called for by the United Nations Secretary-General Kofi Annan in 2000, launched in 2001 and published in 2005 which had prophetic warnings. * Climate change will directly alter ecosystem services, for example, by causing changes in the productivity and growing zones of cultivated and non- cultivated vegetation. * Climate change is projected to exacerbate the loss of biodiversity and increase the risk of extinction for many species, especially those already at risk due to factors such as low population numbers, restricted or patchy habitats, and limited climatic ranges (medium to high certainty). * Water availability and quality are projected to decrease in many arid and semiarid regions (high certainty). * The risk of floods and droughts is projected to increase (high certainty). * Agricultural productivity is projected to decrease in the tropics and sub-tropics for almost any amount of warming (low to medium certainty), and there are projected adverse effects on fisheries. All the warnings have come true. Four per cent of the country’s land area is covered by water. We have 103 distinct natural rivers, manmade lakes and canals accounting for over 10,000 Countrywide. * Limited availability of fresh water on a long-term basis, especially in the dry zone. * The steady growth of population, demanding, basically for increased food production and improved living (sanitary) conditions, which are based on water, in addition to the demand, merged for industrial use, hydropower generation and other uses. * Contamination of existing water resources by increased human activities causing adverse effects on water quality and on the environment. * The increasing trend in delaying the implementation of new water resources development projects due to higher project costs, lack of funds and social and environmental problems. * Poor institutional capacities, lack of clear understanding of guidelines and policies and messed up priorities in managing the already developed water resources. We do not know how much water we have underground. We do not know how much water we have in our national underwater sump. But we draw on it merrily without a care in the world.